Glenn Ford plays a straight-arrow police detective named Bannion in Fritz Lang's "The Big Heat" (1953) -- unbending, courageous, fearless. He takes on the criminals who control the politics in his town and defeats them. One of his motives is revenge for the murder of his wife, but even before that happens he has an implacable hatred for the gang headed by Mike Lagana (Alexander Scourby) and his right-hand man Vince Stone (Lee Marvin). "Thieves," he calls them, preferably to their faces. He is the good cop in a bad town. That at least is the surface reality of the film. But there is another level coiling away underneath, a subversive level in which Lang questions the human cost of Bannion's ethical stand. Two women lose their lives because they trust Bannion, and a third is sent to her death because of information Bannion gives her. That may not have been his conscious intention, but a cop as clever as Bannion should know when to keep his trap shut. The film is as deceptive and two-faced as anything Lang ever made, with its sunny domestic tranquility precariously separated from a world of violence. Bannion thinks he can draw a line between his loving wife and adorable child, and the villains he deals with at work. But he invites evil into the lives of his wife and two other women by his self-righteous heroism. Does it ever occur to him that he is at least partly responsible for their deaths? No, apparently it doesn't, and that's one reason the film is so insidiously chilling; he continues on his mission oblivious to its cost. Oh, he's right, of course, that Lagana and Stone are vermin. But tell that to the women he obliviously sends into harm's way. He's working on a case that begins with the suicide of a cop who was sick of being on the mob's payroll. He questions Bertha, the cop's widow (Jeanette Nolan), who says her husband killed himself because he was sick. Bannion doesn't think her story smells right, and then is approached by Lucy (Dorothy Green), the cop's mistress, who tells him the cop was in perfect health. Bannion unwisely tells Bertha what Lucy told him, she tells Lagana, and Lucy is dumped dead on a county road. If he suspects Bertha and half-believes Lucy, and Bertha is still alive, then she must be talking to the mob. Why didn't Bannion suspect that? How naive can he be? Bannion is told by his boss to lay off the case: "I got a call from upstairs." That night his wife (Jocelyn Brando, Marlon's sister) gets a threatening telephone call, and Bannion is enraged. He walks into Lagana's house, threatens him and beats up his bodyguard. Does he think this might put his own family in danger? Apparently not, until a bomb goes off when his wife starts the car. Within a few days, he threatens Vince Stone and orders him out of the bar where the mob hangs out. Stone's girl Debby (Gloria Grahame), fed up with Stone, follows Bannion onto the street. He takes her to his hotel room, where they drink and he pumps her for information, and there is just a moment when he almost forgets he is a recent widower. Debby was followed to the hotel, and when she returns to Stone, he throws a pot of boiling coffee into her face, in one of the most famous scenes in noir history. Her face half-covered by bandages, she escapes from the hospital and asks Bannion to protect her. He tells her that Bertha the widow has the goods on the mob, is being paid off by the week and has arranged for the information to go to the papers if she dies. Does he tell Debby this because he wants her to kill the widow? Does it even occur to him that she might, as a way of avenging the scars to her face? Does he expect that will lead to her own death? Of course not. In a passive-aggressive way, he blandly sets these women up for death. When the elderly, lame bookkeeper at a junkyard risks her life to give him information about his wife's killer, he even persuades her to knock on the killer's door so she can identify him. Dangerous? Yes, but, to Bannion, an acceptable risk -- for her. Fritz Lang (1890-1976) was one of the cinema's great architects of evil. His "Metropolis" (1927) is one of the best of all silent films, but it was with "M" (1931), and Peter Lorre's eerie performance as a child murderer, that he stared unblinking at pure malevolence. He fled Hitler and Germany and became a prolific director of Hollywood genre pictures -- some competent, some masterpieces of film noir, the greatest "The Big Heat." There is a kind of ironic pessimism in his work, undermining the apparent bravery of his heroes. Glenn Ford plays a perfectly acceptable honest cop in "The Big Heat." He can be quiet and contained and implacable, butthatBannion is for surface and show. When he gets angry, he's capable of sudden violence -- as when he nearly strangles two characters. 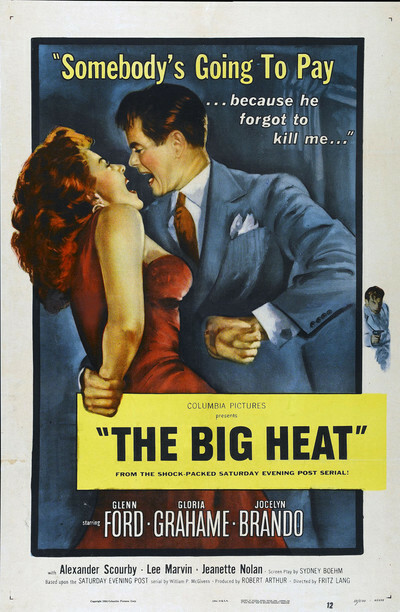 "The Big Heat" advances dutifully with Bannion like a conventional police procedural until about the halfway point, when it takes fire with the performances of Lee Marvin and Gloria Grahame. This is one of the inspired performances of Grahame, a legendary character who became known as the "Can't Say No Girl," and not just because she sang the song in "Oklahoma!" Her untidy personal life led to four marriages and many affairs; one of her husbands was the director Nicholas Ray, after she worked for him in "In a Lonely Place" (1950), and another was Ray's son, Anthony. She won an Oscar for best supporting actress for "The Bad and the Beautiful" (1952) and should have won again the next year for "The Big Heat," where her energy is the best reason to see the film. There was something fresh and modern about Grahame; she's always a little ditzy, as if nodding to an unheard melody. She was pretty but not beautiful, sassy but in a tired and knowing way, and she had a way of holding her face and her mouth relatively immobile while she talked, as if she was pretending to be well-behaved. "It wasn't the way I looked at a man," she said, "it was the thought behind it." She always seems a little unstrung in "The Big Heat," as if she knows she's in danger and is trying to kid herself that she isn't. The Marvin character can be brutal to women; he hits one in a nightclub, and she tells Bannion that he hit her, too, "but most times, it's a lot of fun. Expensive fun." Intriguing, how she half-tries to seduce him in his fleabag hotel room: "You're about as romantic as a pair of handcuffs. Didn't you ever tell a girl pretty things? You know, she's got hair like the west wind, eyes like limpid pools, and skin like velvet?" Lee Marvin made a scary foil for her, with his long, lean face and his ugly-handsome scowl. If Alexander Scourby's mob boss seems like a writer's conceit, Marvin's character brings real menace into the picture, coldly and without remorse. The scene with the scalding coffee has become so famous that you forget it happens off-screen. Afterward, when the bandaged Debby turns to Bannion for protection, she bravely still tries to keep up her act: "I guess the scar isn't so bad -- not if it's only on one side. I can always go through life sideways." On the surface, "The Big Heat" is about Bannion's fearless one-man struggle against a mob so entrenched that the police commissioner is a regular at Marvin's poker game. But if that were its real subject, it would be long and flat and dry. When Bannion returns to his job, reclaims his old desk, is greeted by his fellow cops and goes out on another case, he lets the guys know it's still business as usual; as he leaves the office he calls back over his shoulder, "Keep the coffee hot." Not, under the circumstances, very tactful. Bannion's buried agenda is to set up the women, allow their deaths to confirm his hatred of the Lagana-Stone crew, and then wade in to get revenge. Of course he doesn't understand this himself, and it is perfectly possible for us to watch the movie and never have it occur to us. That's the beauty of Lang's moral ambidexterity. He tells the story of a heroic cop, while using it to mask another story, so much darker, beneath.